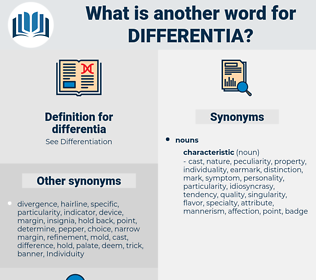 What is another word for differentia? hate, dislike, abnormality, unimportance, whole, hatred, inability. Yes, symphonies, indeed, in the ears of memory are the names of the lightest loves that flittered butterfly - like across our path in the golden summer of our lives, each name calling up its human counterpart, with her own endearing personality distinguishing her from all other girls, her way of smiling, her way of talking, her way of being serious, all the little originalities on which she prided herself, her so solemnly held differentia of tastes and manners - all, in a word, that made you realize that you were dining with Corinna and not with Chloe. It has also been called by some the differentia numerica, and by Scotists the haecceitas. 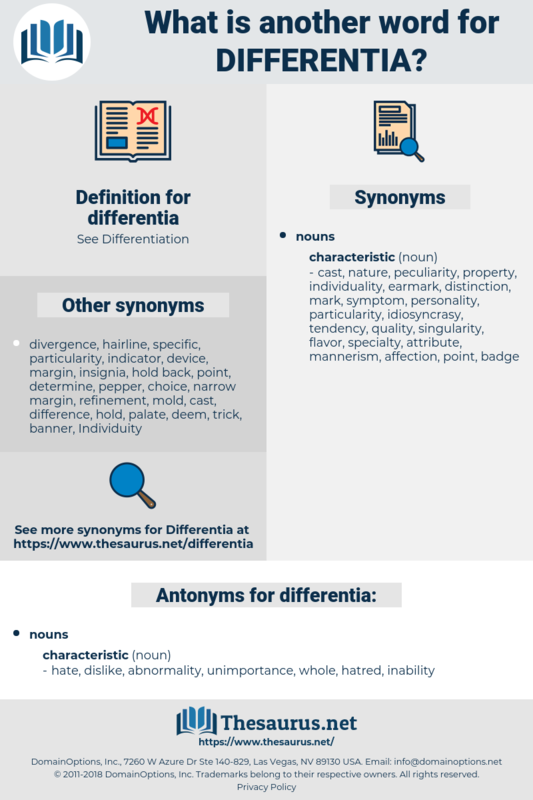 deferent, differentiate, deformity, different, debarment, deferment, dedifferentiated, deformed, data format, differentiated, dedifferentiate, Defibrinate, defrayment.